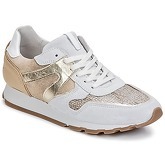 White/beige/gold women's shoes, leather insole, leather / textile upper, leather lining, rubber sole. 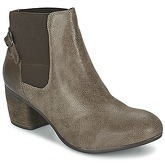 Taupe boots, heel height 6.0cm, height of upper 1.0cm, leather upper, lining and insole, leather sole. 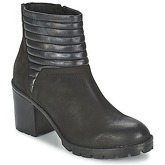 Black boots, heel height 8.0cm, height of upper 13.0cm, leather upper, lining and insole, rubber sole. – style, femininity and everyday comfort – this what the Dutch footwear brand guarantees. Its sandals, ballerinas, oxfords, boots, high boots and sports shoes are characterized by amazing design and high quality materials – natural, soft leather and suede in very fashionable colors: black, grey, navy-blue, claret, red, orange, powder pink and all possible shades of beige. Feminine insertions such flowers, pleats, ruffles and ties give SPM shoes unusual appearance. SPM shoes are ideal for both a romantic girl and an active woman who expect shoes to be comfortable and combine classic with current trends, reflected in a thoughtful, gentle and subdued manner. These shoes just made for go-ahead women who are aware of their beauty and strength of character and who want to emphasize their personality.